Twenty-five years ago, the Hubble Telescope was launched to look out to the vast darkness of outer space. It captured thousands of images of previously unknown stars, galaxies, and clouds of matter, literally expanding the boundaries of human vision and knowledge. At the same time, Cabell Davis, a biologist at Woods Hole Oceanographic Institution (WHOI) was contemplating how humans could expand their view into the vast darkness of inner space. He spearheaded development of an instrument called the Video Plankton Recorder, or VPR, to capture images of the multitudes of tiny, unseen life in the ocean—plankton. Plankton is a catchall term (from the Greek word for “drifter”) that includes bacteria and other microbes, single-celled plants, tiny animals, jelly-like animals, and larvae. The vast majority of marine animal species are plankton for part or all of their lives. Individually small, plankton are collectively mighty. Single-celled algae produce about half the oxygen in Earth’s atmosphere. Abundant plant and animal plankton are the heart of the food webs that sustain fish, seabirds, marine mammals, and eventually people who depend on seafood. A key question is, how will plankton and ocean ecosystems be affected by ocean conditions that are rapidly changing today? Excess carbon in the atmosphere from fossil-fuel burning is being absorbed by the ocean and lowering its pH. Ocean temperatures are also warming, and circulation patterns may shift. 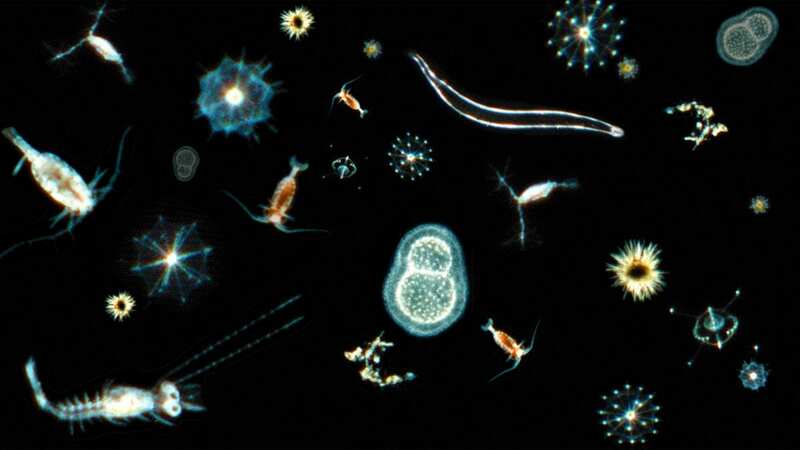 Basic information about which plankton live where, when, and under what conditions has remained out of our grasp because of the difficulties of finding, identifying, and counting such small organisms in such large ocean areas. Traditionally, scientists sampled plankton with towed nets, but nets are blunt instruments, mixing and damaging fragile plankton. Moreover, nets capture merely a snapshot of plankton in a particular time and place, often missing dense patches of plankton that are unevenly distributed through the sea. As a result, scientists have underestimated plankton abundances. To overcome these problems, Davis, fellow WHOI biologist Scott Gallager, and other WHOI engineers created the VPR in the 1990s. It is essentially an underwater microscope, with a strobe and camera, that’s towed behind a ship. The VPR is also equipped with sensors to measure temperature, salinity, chlorophyll and light levels, turbidity, dissolved oxygen, and other ocean conditions. In late winter of 2015, Davis and WHOI researchers Fred Thwaites, Melissa Patrician, and Phil Alatalo successfully towed the latest VPR model—with improved imaging technology contained in a much smaller, faster housing—aboard the research vessel Alucia, as it transited more than 5,000 miles from Hawaii to Panama. The cruise provided the first high-resolution data on the distribution of plankton, including fragile forms, across the Pacific. The stage is set for opportunistically using the VPR on other long ship voyages to begin to reveal the planktonic universe. This research was funded by the Dalio Explore Fund.